Founded in 1983 by Professor Bruce Hozeski of Ball State University, The Interntational Society of Hldegard von Bingen Studies is comprised of scholars and enthusiasts interested in the promotion of the twelfth-century magistra, visionary, theologian, composer, healer, artist, leader of women, Saint and Doctor of the Church. 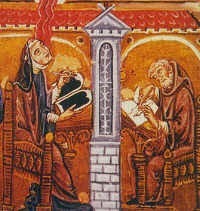 The purpose of the society is to promote study, criticism, research, and exchange of ideas related to all aspects of Hildegard von Bingen’s work. Methods of achieving this purpose include but are not limited to: scholarly exchanges via open peer review, inter-institutional cooperation, annual meetings, participation in conferences, the publication of a newsletter, and the endorsement of other publications relating to Hildegard von Bingen studies. In particular, the Society is working to make high-quality resources for the study and appreciation of Hildegard available electronically here on its website, including a brand-new edition of the collection of her musical compositions, the Symphonia. Qualelibet is the Society's bi-annual newsletter, which features articles touching on all aspects of Hildegard's life & reception - from in-depth scholarly source studies to modern-day reception history and concert reviews. As the ISHBS is an inclusive organization intended to promote dialogue among scholars and enthusiasts, Qualelibet welcomes studies from all perspectives and methodologies as we explore the life and works of Hildegard and related subjects. Interested? Check out our Frequently Asked Questions about Hildegard to get started. Feel free to poke around and join the conversation! There is something for everyone, whether peer-reviewed scholar or casual enthusiast.